Hi guys, Some may remember my boats, as I have hit most of the forums over the years.. 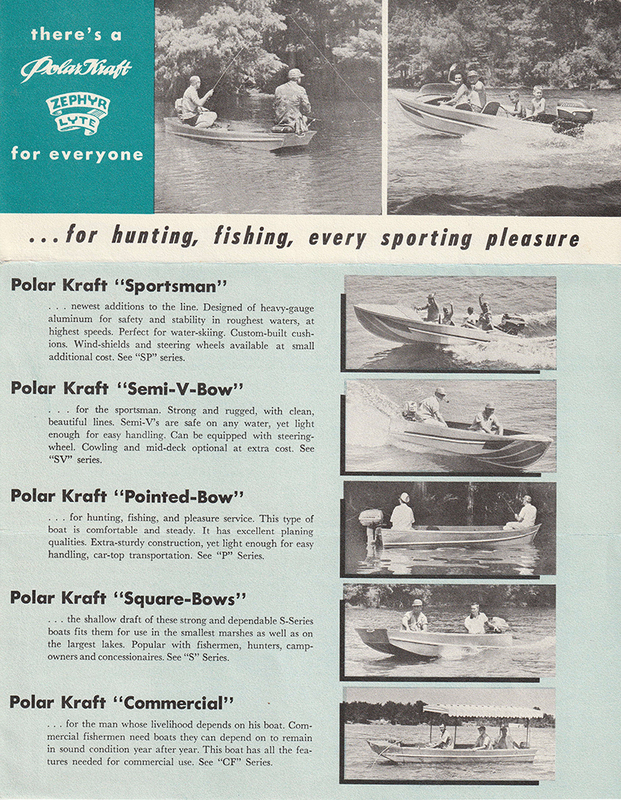 I'm still looking for info on a Polar Kraft and a Sports Kraft.. 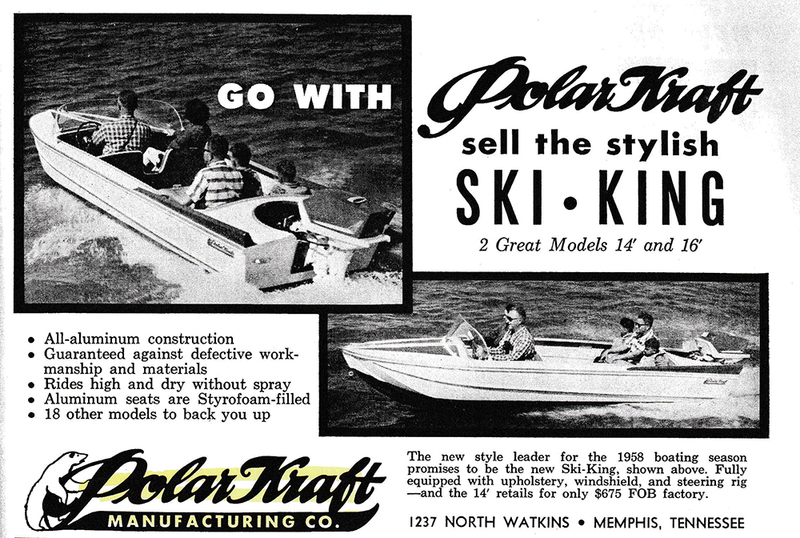 I believe the Polar Kraft is a 58 Ski Princess, although I have yet to find a picture or brochure that positively identifies it as such.. There are subtle differences that keep me from a positive ID.. I have no paperwork and the HIN tag is long gone.. 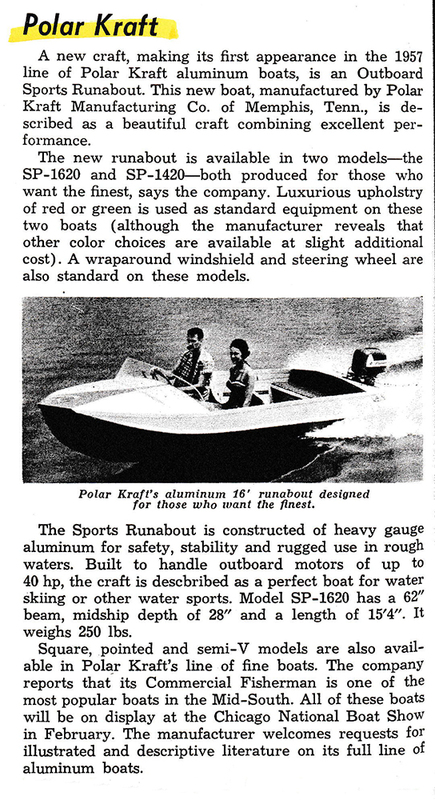 The Sports Kraft has a title that says its circa 1956, but doesn't indicate what model.. I'm fairly sure, because of its dimensions, that its a Continental Cruiser.. 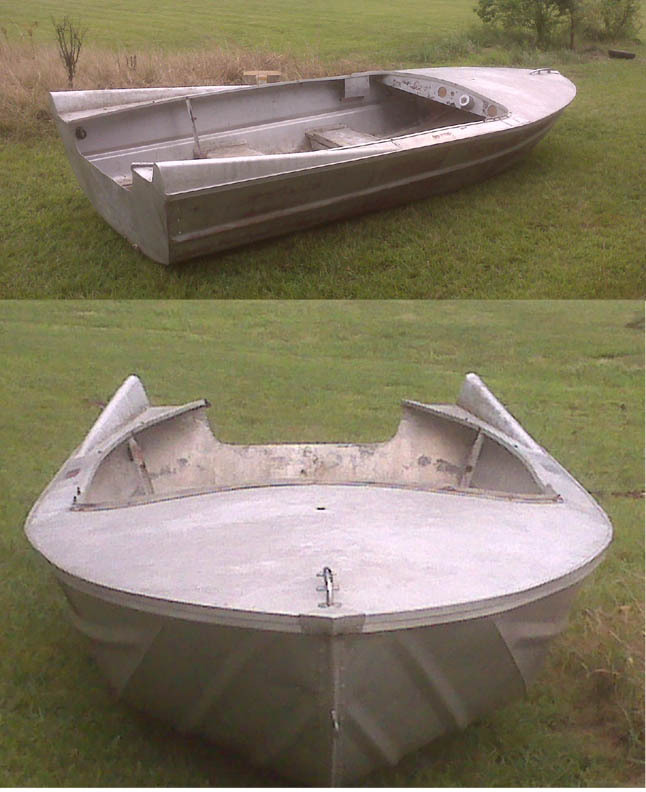 So I am looking for any and all info I can get for these boats.. I will be more than happy to post anything that I have if someone needs.. Wondering if the second picture might be a Cadillac. There was one for sale in my area several years ago with the same style fins. I can say with great certainty that it is a Polar Kraft.. it's either a Ski Princess, or a Ski King.. Both were made in a 14' length.. I just can't seem to match it with a definite model number or year.. A few years ago I was in contact with a man who had one, (the only other one I've seen).. He didn't know or care what it was, he just liked the boat.. He kept it at his summer place, so it wasn't handy for him to look and answer questions.. The rear deck is what has me puzzled.. 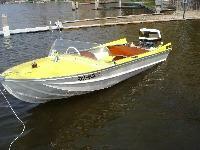 In every old ad or brochure I see of these boats,.. they have a rear deck.. Both mine and the other one I've seen, have no rear deck.. I finally acquired the other boat like mine.. I thought once I had my hands on it, I could answer some of my questions about the first one.. Once I got it home, and saw them side by side, I realized that they are not the same boat.. The first one is longer, wider, and deeper than the second.. 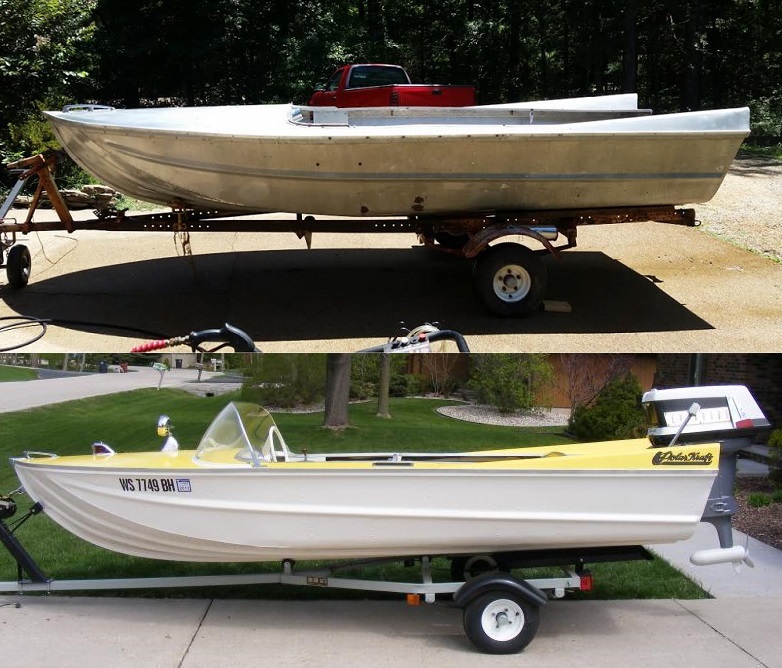 So now I have two Polar Kraft boats with no definite year or model.. 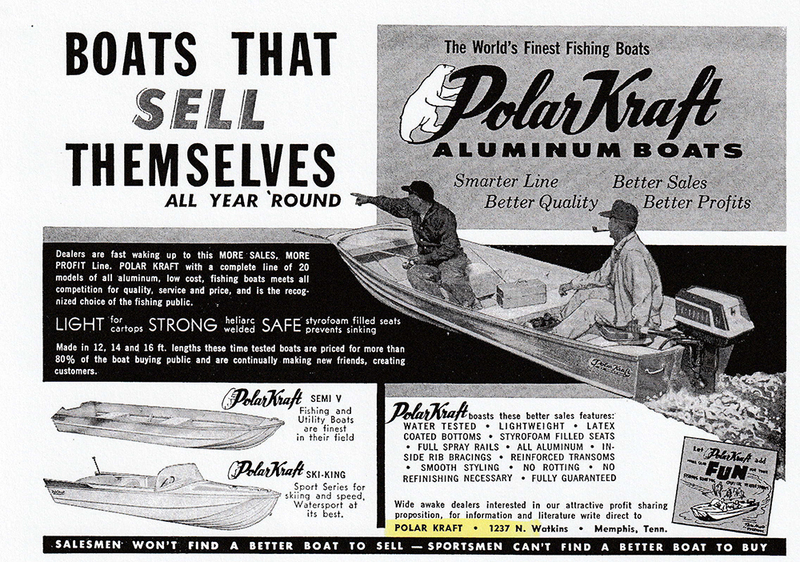 I've looked into my Polar Kraft file, and here is what I have on the early boats. 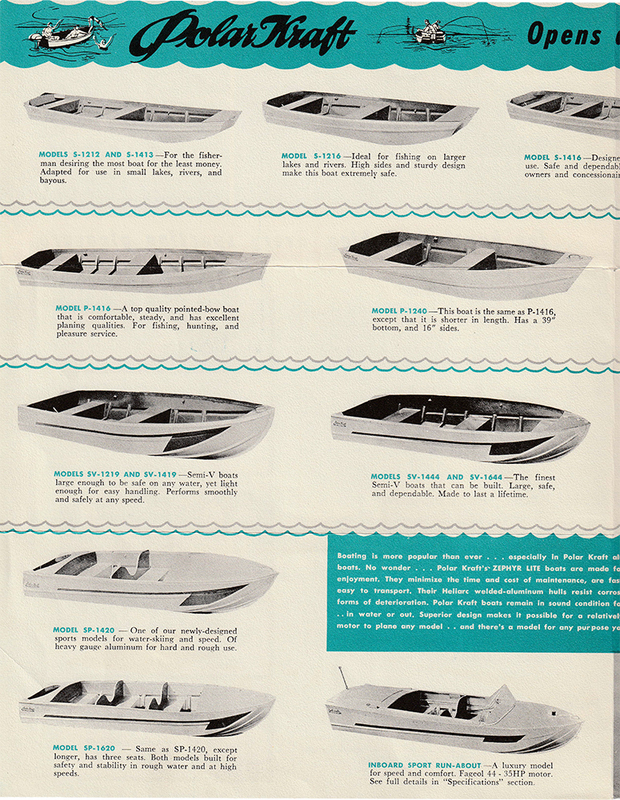 The first four images are from the 1957 catalog/brochure. 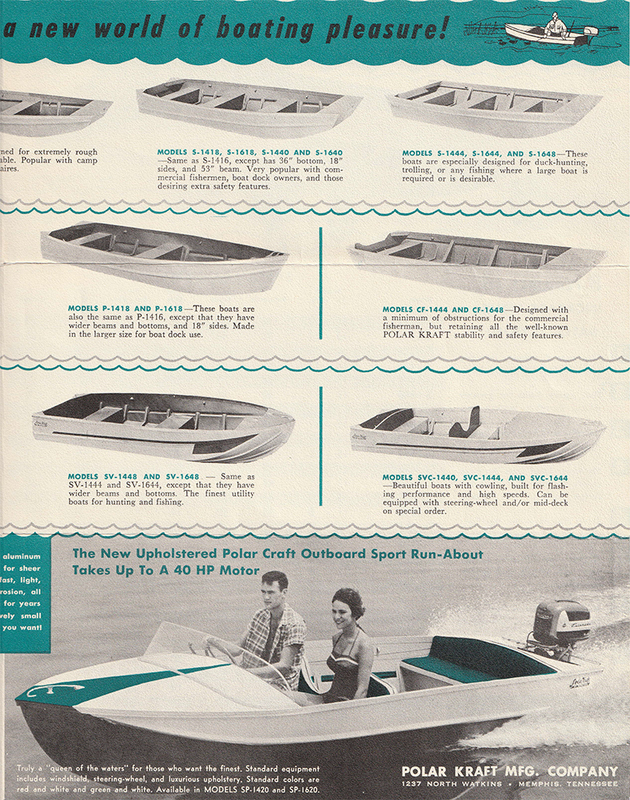 The big difference between the 1957 and 1958 boats are the lack of covering boards and no fins. The first announcement is from a 1957 trade magazine. 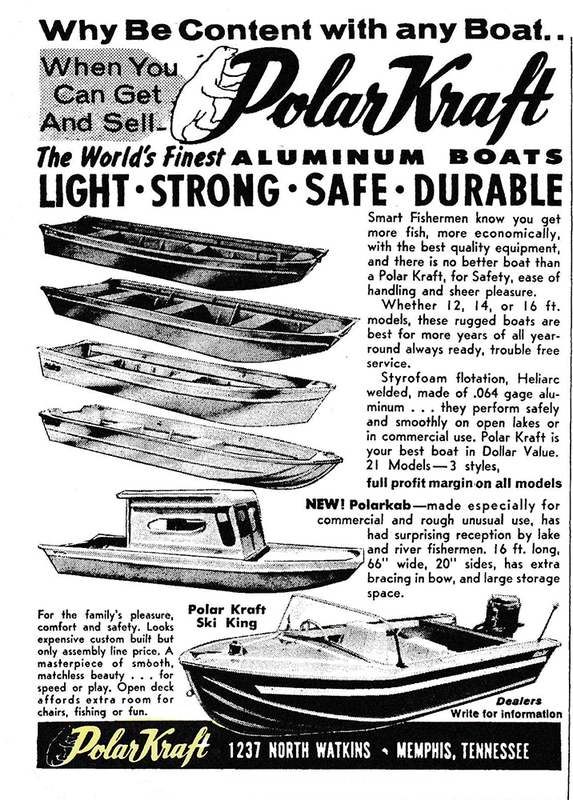 The next ad is from 1958, showing the addition of fins. The fins ran at least until 1961. There is a subtle difference between the fins from 1958 and 1959. 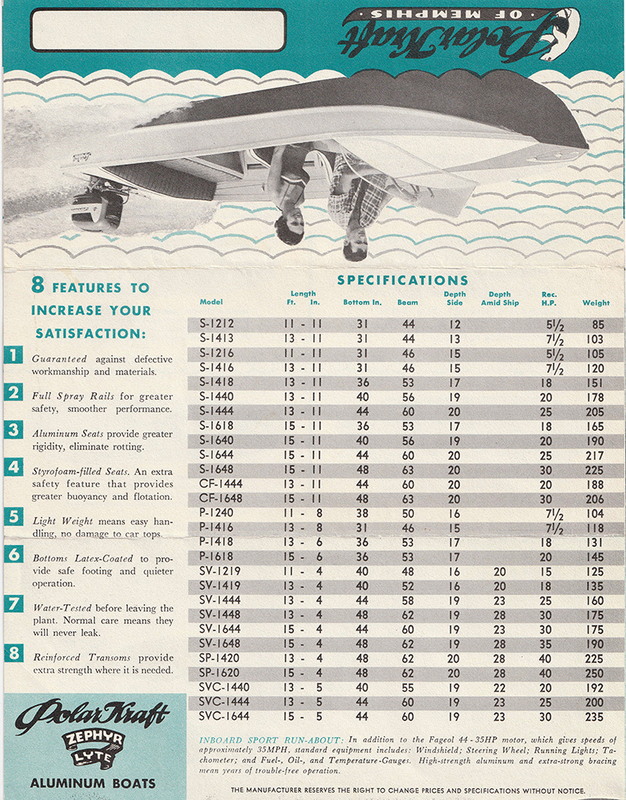 Going back to the 1957 brochure, could your boats be in the SVC line? I don't have the 1958 catalog that would document this, but that is my guess. I hope that perhaps this will narrow your search somewhat. 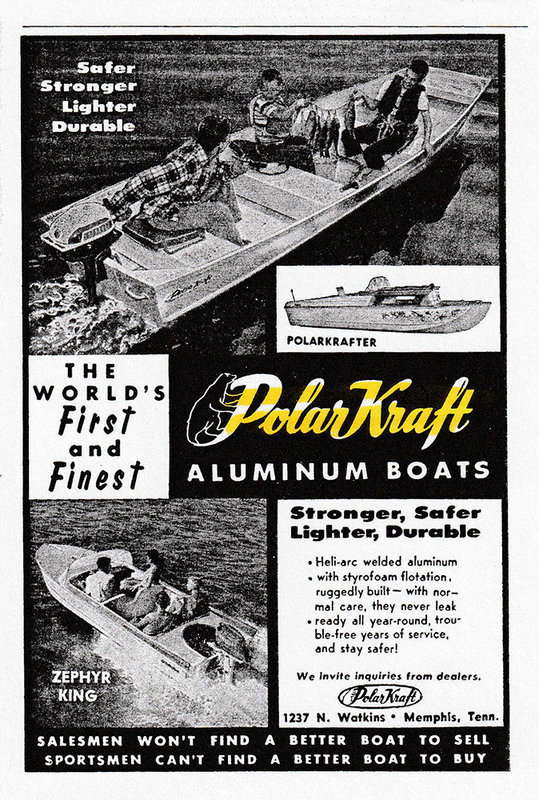 I have Polar Kraft catalogs from the mid-sixties and up but I don't think that your boats are anywhere near that new. I'll try to get into my Sports Kraft stuff and see what I can find. Lee,.. Thank you for the info.. I have recently started thinking maybe they could possibly be in of the SVC model line.. Looks like all of the ski king/Princess line had a rear deck.. There was also a Zephur line that I know nothing about.. I have been meaning to sit down and sort out the measurements and see if I can narrow it down some.. I'm afraid without pictures, I'm just guessing..
Back when I acquired the first boat, the ID tag was in it.. I remember looking at it.. That's how I knew from the start it was Polar Kraft.. The name I remember was "Ski Star", but everything I know now tells me that I am remembering it wrong,.. since I have yet to run across anything Polar Kraft with that name.. The tag disappeared shortly after I got it home.. I know somewhere someone has that missing piece..